100 Lights: my favourite have always been clear lights. They are classic and make the tree ‘twinkle’ and look totally glam! Wrap the lights throughout each branch. This will give the lighting of the tree depth! 6 ft of Decorative Garland: This is usually beads, tulle or ribbon. Stick with the same colour family and avoid sticking it deep into the tree. Tree garland should be quite visible and hung on or within the tips of the branches. 25 Pieces of Ornaments: This is very important! One thing you don’t want is a tree that looks empty….unless you’re going for a totally modern look, but typically, it’s OK to overload the tree with ornaments! Pick a colour family to a max of 3, of which can include a metallic like gold or silver (just try not to mix the metallic, it looks tacky.) Ornaments should hold a consistent theme too, very important. Don’t mix themes, it’s very ‘faux pas’. 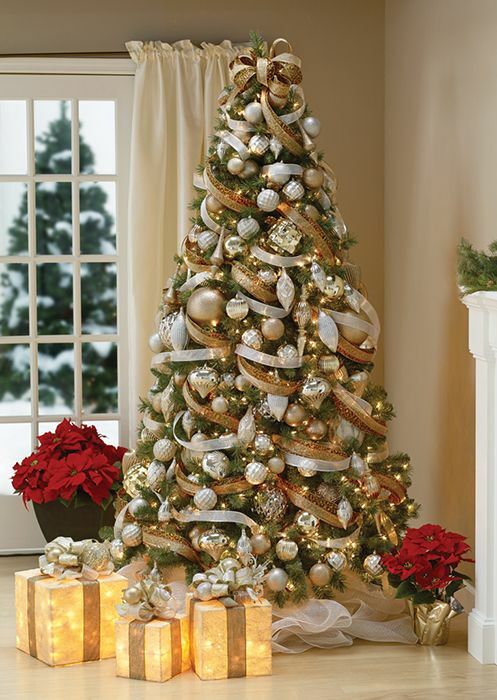 Place the ornaments both on the tips of the branches and inside the tree to add visual depth! So, if your tree is 6 feet high, you will need : 600 lights, 36 feet of garland and 150 ornaments. This seems like A LOT of product, but trust me, it’s what the decorators do!